Eye Magazine | Opinion | Browsing, or reading? Jeremy Leslie’s appetite for magazines is really something. ‘We love magazines’, it says on the front of his magCulture shop, which opened in December 2015, and I believe him. He spent years designing magazines, which he still does, and then in 2000 came his first book, Issues: New Magazine Design, followed three years later by magCulture – a perfect coinage and the seed of a brand. 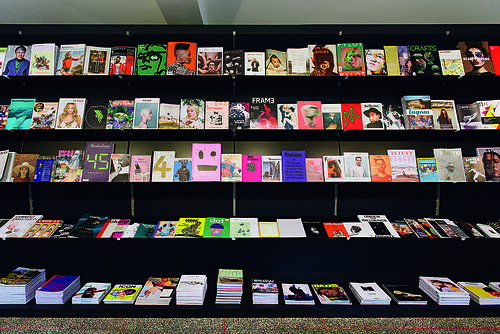 His magCulture.com website, launched in February 2006, became an essential news source for magazine insiders and obsessives, and he added magazine conferences to his roster of magazine-friendly projects, as well as further books and publications. 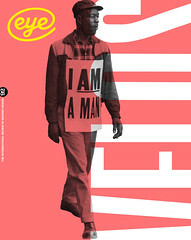 Has anyone done more, in recent years, to champion the cause and embody the ideal of the inventively designed magazine? 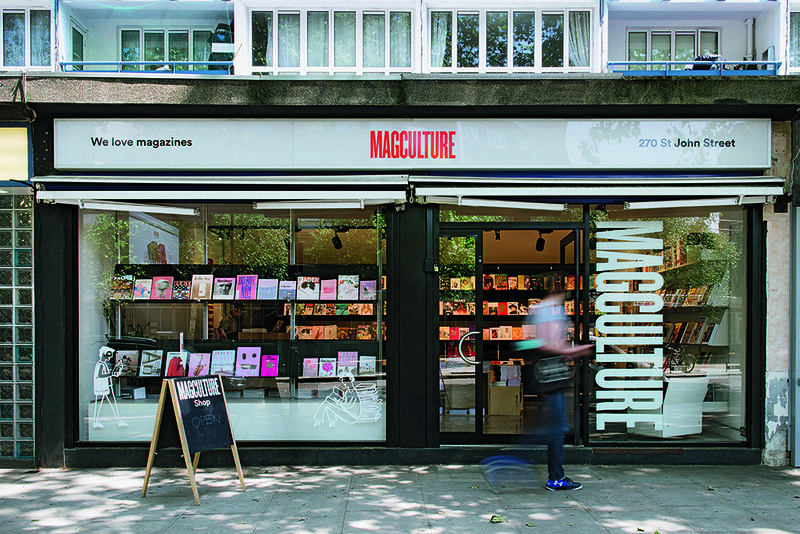 The magCulture shop in London, wedged between Regency Food & Wine and a fast food place on St John Street, is the final element in what shows every sign of being a carefully managed plan. The magazine gods must have wanted this to happen because under the grungy floor covering of the former newsagent he has taken over, Leslie discovered a hidden terrazzo floor, which looks expensive and stylish in a not-trying-too-hard, indie kind of way. He has given the shop a nicely judged gallery feel with spotlights and now virtually obligatory Vitsoe shelves, designed by Dieter Rams, as well as the company’s 620 sofa and armchair. There is space to stage a series of talks and events. I dropped by on a Friday morning (the shop is open from Wednesday to Saturday) and could hear Leslie in his studio at the back recording a podcast. Magazines are magCulture’s raison d’être – there is nothing else on sale, apart from books about magazines – and it stocks around 300 titles. While these include all the familiar independents (Cereal, Fantastic Man, Apartamento, Little White Lies) and some classics like The New Yorker, Leslie also offers a gourmet feast of niche titles, from MC1R for redheads, now in its fourth issue, to Season for women football fans. A ‘We love …’ section at the front singles out Accent, Lunch Lady, Mushpit and Toilet Paper, as well as Japanese stalwarts Popeye and Brutus, which have been around for decades. I picked up and ended up buying the first issue of Unstate, with articles about Pier Paolo Pasolini, Nicki Minaj, Ian Curtis and ISIS, because it looked inquiring and thoughtful, and I liked its fastidious use of photography. It appears to be Spanish, although the text is in English, and like other independent magazines, it prefers to occupy a nebulous international space with no clear place of origin; MC1R, which hails from Hamburg, is also mainly in English. Leslie takes obvious pride in making titles available that cannot be found anywhere else in London. He specially imported copies of The California Sunday Magazine, which is brilliantly designed, and he has a pile of back issues of IL – Intelligence in Lifestyle – from Italy, which cites 1960s trailblazers such as Town and Twen as influences. Top, right and below: Jeremy Leslie’s magCulture shop in St John Street, London. Leslie’s own studio premises are at the back behind the shelves, which roll back on skateboard castors when the shop is used for talks and magazine launches. Photographs: Owen Richards. During my visit, a couple of Japanese women take ages reviewing the stock before deciding what to buy. Another pair of women with luggage, who appear to be new in town, do the same – the word is clearly out. It is a relaxing space to spend time in and there must be competition for those comfy chairs when it’s busy. In London, the existence of the magCulture shop makes the global resurgence of independent magazines seem even more solid and full of possibility than it did before. The commercial titles on the racks in W. H. Smith or the local newsagent look horribly formulaic and lacking in imagination by comparison. If I was left with a question, whiling away a pleasant hour in magCulture, it was the old one about how, or even whether, this branch of culture can be critically addressed. Leafing through Gym Class – ‘The Magazine About Magazines’ – it all feels a bit too cosy and promotional. There are products to sell and everyone is busy selling them. Of the five magazines I bought, two turned out to feature Leslie, confirming his inspirational role on the scene. Everyone is having fun and independence of any kind is clearly a highly desirable state of affairs. While it may be, as Leslie says, that there are buyers for every type of magazine he has in the shop, what yardsticks should we use to decide which ones are any good? In magCulture’s ‘We love …’ section, I found the branded title Mondial, published by Rapha, which sells accessories for cyclists. Despite its fine production values and surface panache, Mondial seemed poorly focused in intent. If I saw Unstate again (most likely in magCulture), I might look at it, but I was not so impressed by the writing that I would put it high on my must-read list. Good writing and editing are the bedrocks of any compelling magazine. Fancy design cannot be a substitute where the foundations are shaky. But are matters of editorial purpose and quality something the magazine scene, with its supportive sense of community, wants to talk about? Can a shop also be a place to promote criticism?